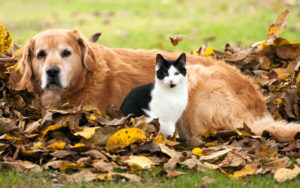 5 Fall tips for a healthy pet. 11 Oct 5 Fall tips for a healthy pet. Mushrooms – yes on pizza, no for our pets. With the damp, darker days of Fall, comes an abundance of mushrooms. If your pet consumes them, be prepared for some severe gastrointestinal upset. At best, you will be cleaning your pet and your house; at worst, hospitalization may be necessary. So be vigilant in looking for mushrooms in your yard or on your walks. Halloween – It’s not all fun and games. Halloween presents two challenges for pet owners. The first is that Halloween is the Number One holiday for lost pets. Strangers in costumes coming to the door will frighten many pets, as well as the door being opened numerous times, presenting ample opportunities for escape. Therefore, it is important to ensure your pet has identification such as a collar and tag, or even better, a registered microchip. The second hazard is the possibility of your pet being poisoned from candy. Chocolate is toxic to dogs, as well as some artificial sweeteners that may be in some sugar free candy. Cold – Great for sleeping, not for joints. 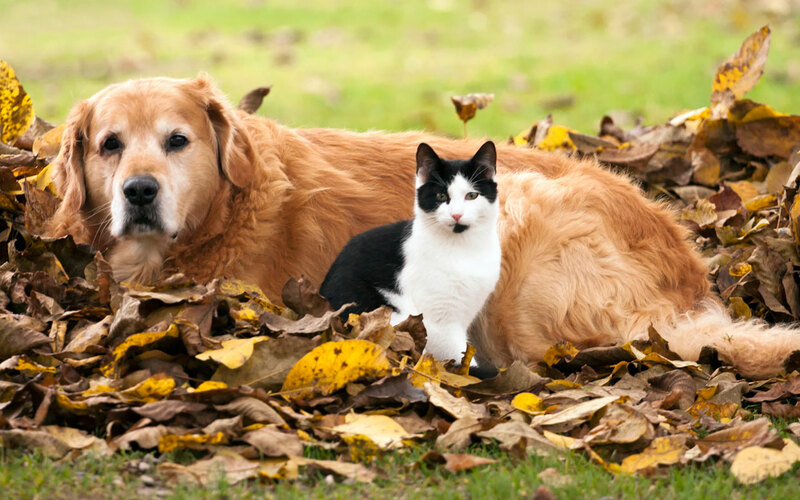 With the colder weather of Fall, arthritis in our older pets becomes more prevalent. There are several things we can do to ease the pain of arthritis (i.e. keep our pets moving, supplements and heat. Joints that are not frequently used can stiffen up. Heat can keep joints loose and mobile. Supplements such as glucosamine and fish oil can help keep the inflammation of arthritis in check. Hunting – It’s not Elmer Fudd out there. October is the peak season for hunting. Make sure both you and your pet are wearing proper bright colors to ward off any hunters in your area! If your pets are allowed to be outside unsupervised, make sure they are unable to wander into a hunting zone. Pests – Some things we don’t want to cuddle up with. As the cold weather drives some rodents into our warm homes, caution must be used with products designed to kill pests. It’s best not to use poison when trying to control pests such as rats and mice, as children and pets might accidentally ingest the poison or the dead pest that had ingested the poison. Live traps and snap traps are better alternatives.